When I was pregnant with Jayden I wanted to know all that I could know. And now with trying to get pregnant again I am wanting to learn more. I don't ever think you can know everything about a topic, especially one like pregnancy and childbirth. I read many books while pregnant with Jayden and have begun reading more again while I try to conceive. 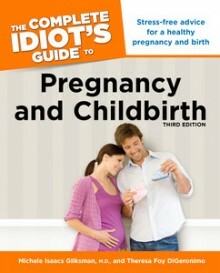 I was recently sent the book, The Complete Idiot's Guide to Pregnancy and Childbirth Third Edition. This book is written by Michele Isaacs Gliksman, M.D., and Theresa Foy DiGeronimo. * Up-to-the minute information on the screenings and vaccinations you might need. * Down-to-earth tips on how to have a "green" pregnancy and birth. * Advice on dealing with common discomforts and problems. * Coaching on having the labor and delivery you envision-and adapting smoothly if you don't. * Helpful clues to the recovery period-what happens after you give birth. * Reassuring advice from a mother of four who is also an experienced OB/GYN. This book is easy to read. Part 1 begins with In the Beginning, topics covered are changes in the mom, common discomforts and problems, tests, and special moms. Part 2 is The Countdown where it counts down the weeks. Part 3 is Food and Drugs: The Good and the Bad, helping with what is safe and what to avoid. Part 4 is Day to Day, what to expect. And part 5 is The Big Day, labor, delivery, and recovery. Each part covers important topics in pregnancy and childbirth. Also through out the book there are some important side information such as Hey mom which gives some advice, Pregnancy facts, Baby Talk which defines words you may not know, Daddy Alert! which has information for the daddy to be, and Green from the start to help reduce your carbon footprint. I find this book really easy to follow. It is easy to read through and/or use as a reference guide. I like that I can jump to a page about a certain topic by using the Index or Contents. I really like the lay out of the book. The Pregnancy facts are helpful. During the week by week the book gives information on the baby's development in the womb, mom's development, and important things you need to know. I think this book is great for any mom whether this is their first pregnancy or their third. I will be keeping this book on my nightstand and will be referring to it often once I become pregnant for sure. I may even have John read parts of it. John is not one to read a book from cover to cover, but the book has the Daddy Alerts in little side notes and the week by week has bullet points. I think John would be willing to read these parts when I encourage him. In the chapter on Special moms it covers the topic of moms over 35. I will be one such mom so this part was important for me to read and the information is helpful. Pregnancy and childbirth can sometimes be scary and this book really helps to put it into simple terms and give information when needed. The publishers of The complete Idiot's Guide to Pregnancy and Childbirth will be donating 3 copies of this book. Follow The Complete Idiot's Guides on facebook and twitter, theses will be extra entries for A Blogtastic Extravaganza 2.0 New Beginnings Prize Pack. GET YOUR EXTRA ENTRIES HERE TO WIN!! Up-to-the minute information on the screenings and vaccinations you might need. I learned this book includes a New Focus on Green birth Births & Pregnancies! I think I would find this part very interesting - as we want to have a Natural/Home birth & continue this idea through the Childs life. I learned that it has 'Daddy Alerts' sidebars throughout the book to include dads! I think my ds would definitely get this if I win! Has info for the daddy to be good!